I ran by it dozens of times on my routine eight-mile loop on Great Falls and Westmoreland. Down at the bottom of the hill near Lemon Road, it looked like nothing more than a neighborhood shortcut. I don’t remember what prompted me to actually check out what turned out to be the Pimmit Run Trail, but I do remember the odd sense of wonder that took hold when I did. I had some exploring to do. other side of the street, a little to the left, all bets were off. I’m not a fervent trail runner. It’s not that I dislike them, but my body has always held up well on pavement and I figured I had better things to do than spend time traveling to run in a park when it was all the same to me. Well, now I didn’t have to choose. Rather than tearing through the trails, the mildly technical terrain, especially north of Old Dominion Road, forced me to savor the experience. The fun for me became finding out where I’d pop out if I left the park. I fancied myself looking for a route to the Potomac River. I knew I was headed in the right direction, there had to be a way… There is, but it’s tricky. And although I fear I am ruining the experience you could have exploring for yourself — for me, the trial and error was half of the fun — here’s some specific direction to keep you on track. Finding way to the downstream section is like realizing you have to blow the whistle near that empty pond to reach level seven of Zelda, it makes sense in retrospect but you probably tried everything else beforehand. If you reach the Highlands Swim and Tennis Club, head up Bryan Branch Road to Linway Terrace. After a quick left on Kirby Road, you have a choice. Keep going on Kirby, head into the Marie Butler Leven Preserve and take one of the wooded trails until you reach Maddux. Or take a right on Chesterbook and left on Maddux. On your right, shortly after 1607, you’ll see a path to the downstream section of the trail, which will bring you along the George Washington Parkway and onto the Potomac Heritage Trail, where you can get off at the Chain Bridge. There are some creek crossings, and sometimes your foot will have to take the plunge to take the next step. But each next step will make you appreciate what you’ll continue to find. 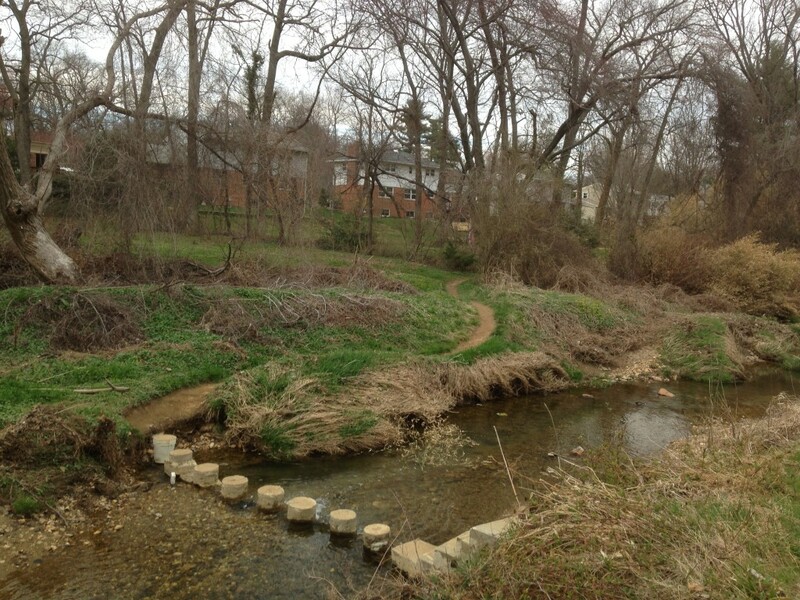 The Pimmit Run Trail is a 1.5-mile run from the West Falls Church Metro Stop. One section of the trail that purportedly connects to Olney Park in Pimmit Hills is impassible because of fencing under the Dulles Toll Road. This article originally appeared in the May/June 2014 issue of RunWashington.